Visiting Heritage Prairie's (HPM) farm stand at the Green City Market, one is certain that there must be some sort of magical land behind it. There is an army of glowing glass honey bears, unique sweet and savory tarts & other kitchen creations, a spread of perfect mini greens and organic vegetables, and hand outs promoting kids camps, workshops, and farm dinners. HPM farm founders Bron and Bob and daughters Margaret and Grace are fun to talk with- especially when it comes to hearing about all the exciting endeavors taking place on the farm. The best part about hearing about the farm: It's an invitation. 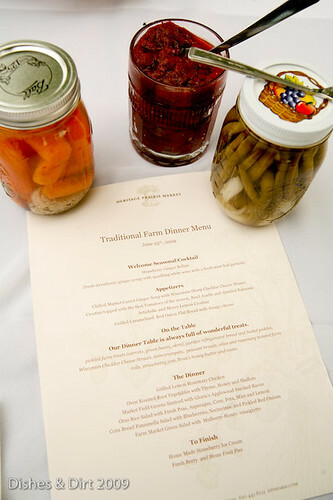 So last Thursday we headed out for the first family style farm dinner of the season. The entire evening felt like a mini summer vacation. We arrived early via train from Chicago on a perfectly hot sunny evening. We poked our heads in the buzzing kitchens and said hello to Portia, Pat, Alex, & Co while marveling over their creations. Then we took an insightful farm tour with Bob, talked to the goats, shopped the market, and socialized while snacking on hors d'oeurves and sipping strawberry cocktails. We sat down to the colossal dinner table speckled with fresh bread & cheddar straws, strawberry-basil jam, honey butter, and a variety of irresistible pickles. When the salads arrived the sun was still high. We ate and ate- Orzo with feta and mint, rosemary grilled chicken & braised greens, roasted root vegetables... The perfect summer meal progressed as did the summer sun- until our mixed berry pie and ice cream were twilight. Stephanie's: Orzo, Feta, & Mint salad. HPM farm is about 2 miles from the La Fox station on Elburn Metra line. Meet up with a ride or take your bike!